Click here to read this article in Spanish! Haga clic aquí para leer este artículo en español! Many people live in fear of snakes, especially of venomous species that can inflict a lethal bite. There is evidence that our fear of snakes is innate, because our ancestors have been preyed upon by them for millions of years, even before we were primates. Other evidence suggests a significant learned component to ophidiophobia. Either way, few people today are at risk of being eaten by snakes, but bites from venomous snakes are still fairly common. However, in my experience fear of snakes is way out of proportion to the actual risk they pose, especially among my fellow North Americans. It's surprisingly hard to find good information on the prevalence of venomous snakebite (hereafter, just 'snakebite'), but it's getting easier, and I was able to gather almost 100 papers that include data on the subject, which I've synthesized here. As a result, this article has many footnotes, and because I used so many references to prepare this article I've provided a selected list at the end of this post, with a link to the full list. So how dangerous is a snake bite? If you're bitten by the wrong kind of snake and you're far from help, it's pretty dangerous. But the truth about snakebite is that it's a lot less likely to endanger your life than people think. First of all, you're pretty unlikely to ever get bitten. Worldwide, estimates range from 1.2 million to 5.5 million snakebites annually. Remember, there are several billion people out there, so although those numbers are large, each year over 99.92% of people are not bitten by a venomous snake. These bites result in 420,000-1.8 million envenomings leading to 20,000-94,000 deaths. 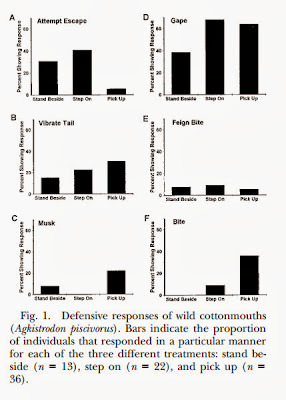 This probably seems really low, until you realize that unlike when they are biting their prey, snakes that are biting in defense don't inject venom every time (i.e., the bite is "dry"). Depending on the species of snake and the context of the bite, estimates for dry bites range from 8% to more than 80%, with North American rattlesnakes, one of the best studied groups, injecting venom only 20-25% [edit 10/23/2015: I made a mistake here. 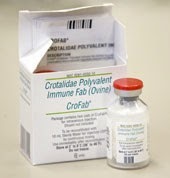 The source cites two other sources that say that rattlensakes inject venom 75-80% of the time (i.e., 20-25% dry bites), not the other way around as I originally wrote. But, Hayes goes on to say that neither of these sources appear to be based on empirical data, and then he gives some other sources that do. These list rattlesnake and other viper dry bite percentages between 7 and 43% (i.e., injecting venom 57-93% of the time). So, indeed, much higher than the 20-25% I originally listed, but still less than for predatory strikes. I apologize for the error.] of the time when biting in defense, compared to more than 99% of the time for predatory strikes.1 This behavior is partly because the strike itself may startle attacker sufficiently and wasting expensive venom needed to eat is useless, and partly because even injecting venom into an attacker is unlikely to immediately incapacitate it. Most snake venom is fast-acting, but it's not that fast. As a result of these dry bites, a lot of snakebites go untreated and unreported because they fail to produce symptoms, leading the bitten person to assume (correctly) that they are safe or (incorrectly) that the snake was not venomous. This is one major cause of the wide range of numbers given above for the prevalence of snakebite. North Carolina, more than in any other state. Worldwide, about 1 out of every 20 people envenomated by venomous snakes dies from the bite, according to the best available estimates for the prevalence of bites and resulting deaths between 1985 and 2008. Depending on where you live, your chances of surviving a venomous snakebite are really good, although in a few places they're pretty bad. I'm going to focus on the USA because I live here and because we have some of the best data. In the USA, only 1 out of every 500 people bitten by a venomous snake dies as a result, which includes deaths from bites that take place under several special circumstances that we'll discuss later. You're actually safer from venomous snakebite in the USA than in any other country on Earth where venomous snakes kill people, thanks to our excellent medical care, relatively benign venomous snake fauna, and large proportion of the population that live in urban areas where venomous snakes are scarce. There are some countries, such as Canada2 and Norway, where venomous snakebites occur but nobody has apparently been killed by one in recent history, except for people who have been killed by their exotic, captive snakes (more on this later). are large and widespread in the southwestern USA. that smaller bite victims have more serious bites). How about all the people who are bitten and survive? Being bitten by a venomous snake isn't exactly a pleasant experience. It's been described as feeling like “hitting your thumb with a hammer”, “stepping on a bare electrical wire”, or “being repeatedly stabbed with a knife”. This alone is a good enough reason to avoid snakebite. However, not every venomous snakebite is a recipe for a nightmare. 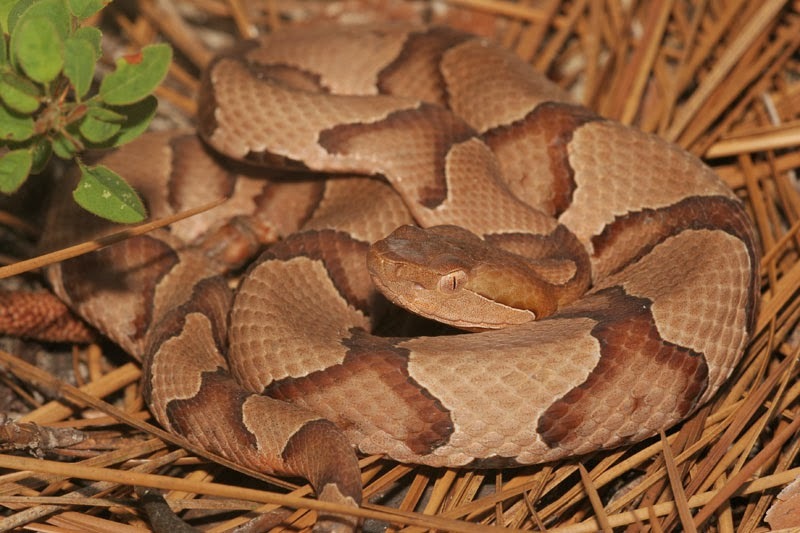 In the USA, most people are bitten by pit vipers (copperheads, cottonmouths, and rattlesnakes). Very few people are bitten by coralsnakes, and I'd be surprised if anyone has ever been bitten by a coralsnake that they didn't first pick up. Pit vipers are generally pretty retiring snakes, a fact observed most poignantly by both the herpetologist Clifford Pope, who called them first cowards, then bluffers, then warriors, and also by Ben Franklin, who wrote of a rattlesnake: "She never begins an attack, nor, when once engaged, ever surrenders...she never wounds 'till she has generously given notice, even to her enemy, and cautioned him against the danger of treading on her." In a field test of these famous anecdotes, Whit Gibbons and Mike Dorcas molested 45 wild cottonmouths (Agkistrodon piscivorus) in South Carolina swamps and found that only 2 in 5 bit their fake hand when picked up, only 1 in 10 bit a fake foot when it stepped on them, and none bit a false leg that stood beside them. 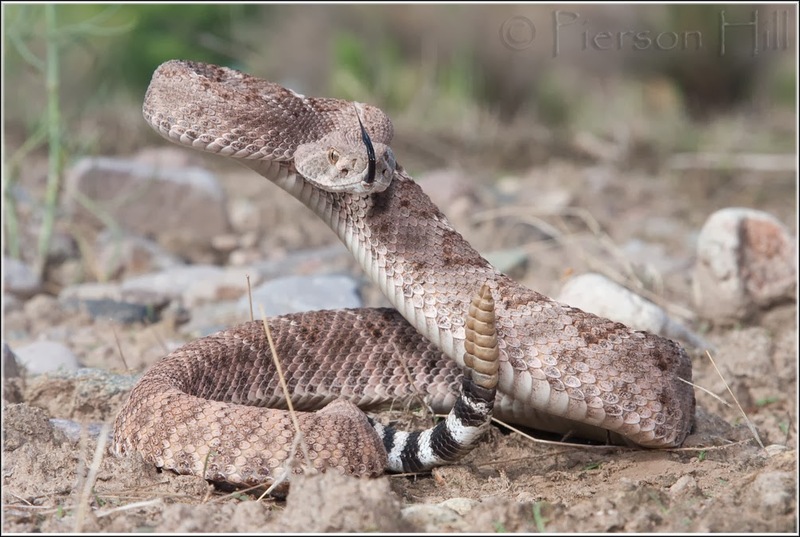 In a similar test, Xav Glaudas and colleagues picked up over 335 pigmy rattlesnakes (Sistrurus miliarius) in Florida and found that only 8% bit the thick glove they were wearing. Further evidence to support the fact that vipers are reluctant to bite potential predators comes from anecdotes from snake biologists radio-tracking snakes to study their spatial ecology, in which the biologist has accidentally stood on Timber and Eastern Diamondback Rattlesnakes and Puff Adders without provoking any responses. This makes sense because striking is a last resort for these snakes, which have a lot to lose and very little to gain by it. Although this isn't a perfect simulation of a typical snake-human interaction (these researchers weren't trying to kill the snakes in their experiments, after all), these findings are a good argument in the snakes' defense - if they bite you, they probably had a good reason. very dense, rural human population in south Asia. 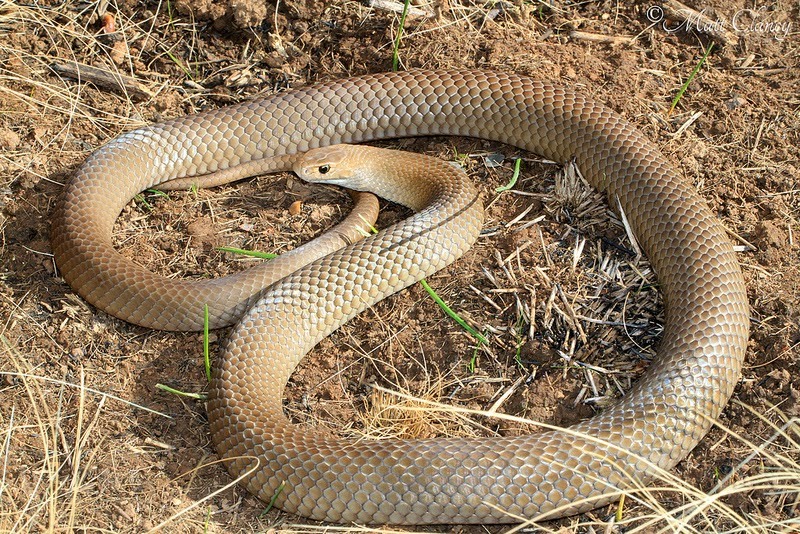 Although the above news is hopeful, it is of course impossible to predict whether an individual snakebite will end in tragedy, so it is prudent to avoid snakebite at all costs. Each year in the USA, between 2,400 and 4,700 (edit: some sources say up to 8,000) bites occur, putting your chances of being bitten by a venomous snake in the USA at about 1 in 100,000 (1 in 40,000 with higher bite estimate).3 If you live in southern or southeastern Asia, you're more justified in having a fear of snakes. In India, at least 80,000 and possibly as many as 165,000 people are bitten by snakes each year (1 in 7,000-14,000). India's venomous snake fauna isn't that much more diverse than the USA's, but medical care isn't as good, and it has about 4 times as many people, many of whom live in rural areas and work in agricultural or pastoral professions, both of which really increase your chances of being bitten. Even in India, "only" about 10,000-15,000 people a year die from snakebite (edit: a more recent study that estimated snakebite mortality in India using household surveys instead of hospital records came up with a figure of ~46,000 deaths in 2005, which is probably more accurate because many victims elect to use traditional therapy in their village and most do not die in government hospitals, where the data are collected; for a more thoughtful discourse on snakebite in India, click here), meaning that about 4 out of 5 (edit: using the newer data, between 1 in 4 and 1 in 2) snakebite victims survive. 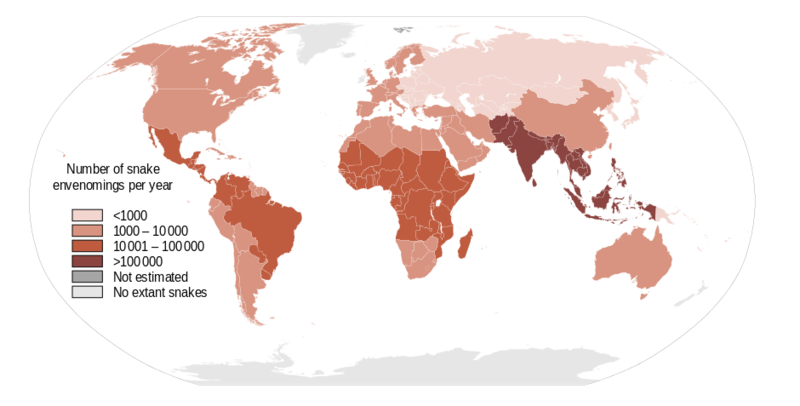 Taking into account your chances of being bitten and your chances of dying from the bite, many countries in sub-Saharan Africa, Asia, and Latin America are risky places to live. Snakebite in these places is a legitimate public health concern. The USA is the least risky country in terms of snakebite. The only safer countries are places like Ireland, New Zealand, Madagascar, and oceanic islands in the Pacific & Caribbean, where no venomous snakes occur. Snakebite risk in the USA is thousands of times lower than it is in many parts of the world, and it would be even lower if people modified their behavior in a few key ways, starting with not attempting to kill every snake they see. The USA (bottom left) is the safest country in the world in terms of snakebite risk. Countries without any venomous snakes not shown. You might be surprised to hear that attempting to kill venomous snakes actually increases your risk of snakebite. This masterful post written by David Steen at Living Alongside Wildlife is a good argument for why this is the case. Specifically, the reason is that up to 2/3rds of snakebites in the USA are a direct result of intentional exposure to the snake and could be avoided if the people involved had made different decisions [Edit 16 May 2018: although recently, more well-replicated studies have shown that this figure is actually closer to 20% to 30%. Even so, I think it's safe to say that trying to catch a snake for any reason increases the chances that it will try to bite you. Killing a snake from a distance, e.g. by shooting it, is of course not nearly as risky from a snakebite perspective, but there are other associated risks and plenty of good reasons not to do that.]. These bites resulted from people who were trying to kill snakes or molest them, or who chose to interact with them for some other reason (ranging from snake handling churches to collection for rattlesnake roundups). 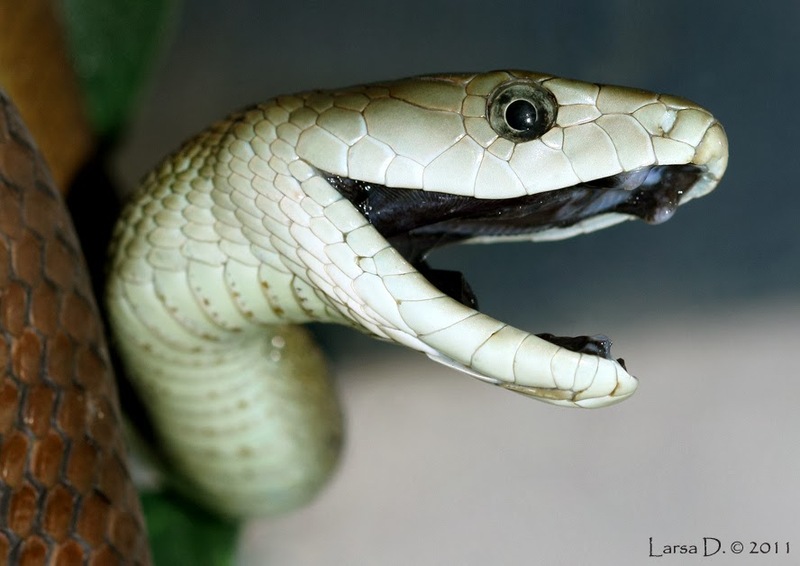 Although snakebite is an occupational hazard for some, such as zookeepers and herpetologists, the vast majority of Americans are at extremely low risk of snakebite. Let's take a closer look at those 5 people a year who die from venomous snakebite in the USA. Not all of these people are hikers, fishermen, and gardeners who fall victim to 'legitimate' bites, as you might assume. This number includes deaths that result from a pair of special cases that deserve special attention. The first is people who keep exotic venomous snakes in captivity in their homes. Although this can be done safely, it isn't always, and it is a little unfair to group these cases in with 'legitimate' bites, envenomations, and deaths from native, wild venomous snakes. It inflates USA snakebite statistics because the risk is not evenly distributed among the entire population and it inflates death statistics because antivenom may not be available for these exotic snakes. About 1 of the 5 deaths each year in the USA can be attributed to these circumstances. The second special case, people who refuse or do not seek treatment after they are bitten, includes some of the bites that also fall under the first case, because some snake owners that keep snakes illegally may not seek treatment out of fear that they will be arrested, fined, or have their animals confiscated. This case also covers religious snake handlers proving their faith, which in many cases entails foregoing treatment. It's harder to put a finger on how many people die in the USA each year from untreated snakebites, but I think it's probably fair to say that most of those people got what was coming to them. Let's not overlook the role of alcohol in people's decisions to interact with venomous snakes: studies show that around 40% of snakebite victims have been drinking. Data on intentionality of exposure to snakes in developing countries is sparse, but I would be willing to bet that exposure in these places is much less intentional, as it once was in the USA. Today in the USA, medical treatment for snakebite is so good (thanks to synthetic antivenoms with few side-effects), and research on snake venom has come so far (with much left to learn! ), that there is little justification for the overblown fear bordering on hatred people have of snakes. Progress toward this same goal is being made by some really smart people researching the venom of snakes in developing countries in Africa, south Asia, and Latin America, and figuring out better ways to make antivenom available outside of a hospital setting. Yet more than 1 in 20 people in the USA have a pathological fear of snakes, as defined by criteria including uncontrollable, greater than justified, and significantly interferes with a person’s routine, occupational or academic functioning, or social activities or relationships. Leading to situations like this recent news story and this bizarre interaction between a man, a gun, and a snake. Risk perception is influenced by many things, including the rarity of the event, how much control people think they have, the adverseness of the outcomes, and whether the risk is voluntarily or not. For example, people in the United States underestimate the risks associated with having a handgun at home by 100-fold, and overestimate the risks of living close to a nuclear reactor by 10-fold. Ironically, evidence suggests that two of these things (how much control you have and how voluntary the risk is) are actually quite high for snakebite, despite popular perception that they are low. also contributes to their low prevalence of snakebite. 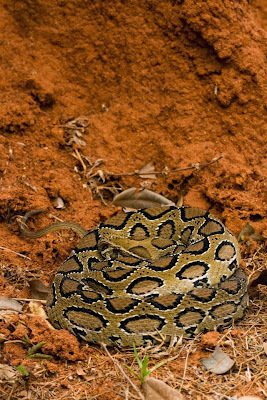 Data on fear of snakes in developing countries is lacking, and it is difficult to generalize, but based on the impressions of several people I know who have lived and worked there, most inhabitants of rural areas in developing countries are terrified of snakes. One notable exception is Madagascar, where no venomous snakes occur and it is fady to kill any snake (edit: although apparently superstitions still abound). In contrast, in Australia people seem to have a relatively high level of respect for snakes and don't seem to mess with them solely out of machismo the way they do in the USA. 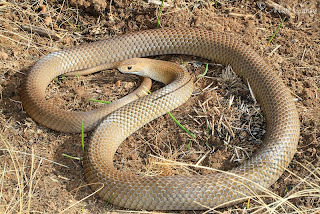 Venomous snakebites are relatively rare, which is remarkable considering that the majority of snakes in Australia are venomous. I heard a story recently about a newly-hired Australian CEO of an American mining company. When the new boss asked about the snake policy, the employees jokingly replied that it was "a No. 2 shovel". The Australian CEO was not amused, because at his previous company Down Under routinely relocated much more dangerous snakes at their job sites. He instituted a company-wide training program to teach safe venomous snake practices. These classes are also available to the general public in some areas, especially in southern Africa. As people and wildlife come to share more and more space, snake-human interactions are inevitable. The future of conservation will probably be in maximizing compatibility between humans and wildlife rather than preserving pristine areas, we will need to get a lot better about behaving ourselves to keep ourselves safe from the defense mechanisms of wildlife, starting with educating ourselves about the real risks that underlie our fears. Everyone should read these guidelines for snakebite prevention and first aid. I would add to this: don't kill snakes! It only puts you at risk. Don't try to kill them, don't let your friends kill them, don't let your family members kill them. They won't try to kill you. I promise. 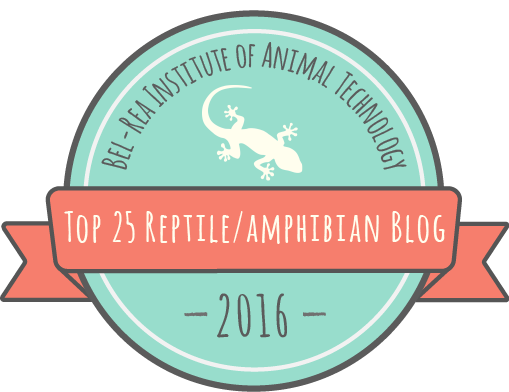 For more about snakebite research and treatment, check out Dr. Leslie Boyer's blog and Bill Hayes's snakebite research page. Thanks to Julia Riley and James Baxter-Gilbert for providing me with information on deaths from snakebite in Canada, to Wes Anderson, James Van Dyke, and Xav Glaudas for sharing with me with their impressions of people's fear of snakes outside of North America, and to Matt Clancy, John Worthington-Hill, Larsa D., Todd Pierson, and Pierson Hill for the use of their photography. If you're so inclined, check out David Steen's post on why it doesn't make sense to kill venomous snakes in your yard here and Jessica Tingle's historical view of the subject here. featuring facts in this post! You are quite right David. I hope I was sufficiently sensitive to the fact that snakebite is a big problem in many parts of the developing world (although even there it's perhaps not as bad as the average person thinks). I did consider a Part II focusing more on areas other than North America. Even in the tropics I don't think killing snakes is the answer. You were quite sensitive, Andrew! A Part II would be nice to highlight the fact that the statistics that we have are underestimates of the problem in the tropics and the many obstacles (antivenom research, drug distribution, etc) it faces for being a Neglected Tropical Disease. Glad to hear it! I was glad to hear it has been officially designated an NTD. The stats I included in this article for global snakebite are theoretically corrected to compensate for the incomplete nature of the data from these areas. For more detail see this link. And I couldn't agree more that killing snakes is not the answer. It becomes a little more difficult to engage people in this mindset in the tropics. From field experience, though, it's possible! Hi Andrew, this is the first time I've wondered onto your blog, and if this is the quality of writing on it, I'll be a regular. I grew up and live in Africa, and have a great deal of experience with snakes and snake bites. As a child I lived in Northern Kenya, where from the age I could drive I was doing medical emergency trips taking people from remote areas to the hospital. Many, many of them from puff adder bites while collecting firewood. As an adult I've worked as a guide, and in the deserts where I worked frequently saw and handled snakes. Despite all that, I have never been bitten by a venomous snake. I have been telling guests having this discussion frequently, and will likely point a good few people to this post in the future. Thanks for the kind words Vernon. Would you agree that even in Africa fear of snakes is disproportionate to the actual risk they pose? In your experience, are guests or locals more afraid of snakes? Andrew, I do totally agree that even in Africa fear of snakes is disproportionate to the actual risk. But, fear of snakes seems to be directly proportional to how much contact people have had with them - both locals and guests. Of course, being a guide I have a higher percentage of guests who actually want to see a snake. Snakes to get attention - fear or not - when I was guiding at a lodge and had apathetic 16 year olds who wish they were home with their friends instead of safari, I would do my absolute best to find the biggest, baddest snake I could - then I had their attention the rest of the trip. So you would say that people who have had less contact with snakes are more or less afraid of them? Because in my experience in North America it is the former (less contact leads to more fear). Sounds like a winning strategy to get respect from those teenagers - the snakes already have their respect. More contact, less fear, for sure. Sorry for not being clear. I didn't want to spam up your comments by writing a huge essay, so I end up being a bit unclear. Yes, and just a disclaimer - I don't mess with snakes, only catch them where it is needed and certainly don't catch dangerous snakes for teenagers to handle far away from potential medical care. I really love snakes, but have serious respect for them myself. I could write a long essay on my guess regarding a lot of snake bites that I have seen - it's mostly related to desertification, diminished fuel (fire wood), and the growing struggle to find firewood. People are tired, spending days walking to get enough firewood, and then get more careless. It's a guess based on what I saw as a kid. Interesting guess. Glad to hear of your respect for them. Your comments are definitely not spam, no matter how long they are! Great article, my daughter just found her first coral snake which started a lot of discussion at the house and I posted a pic on her site with a story, http://scalelily.weebly.com/ . She is only 10 but obviously knows that people keep venemous snakes and is curious as to why. One of the questions I could not answer for her was what do people feed coral snakes? Thanks Calvin, beautiful find and impressive ID skills by your daughter. You did the right thing, although some studies have shown that relocating rattlesnakes far from where you find them dooms them to certain death by starvation because they don't know their way around. I don't believe anybody has studied this in coralsnakes however. Chances are there are lots more in that area but you never see them because they are underground. As you saw, the chances of a coralsnake biting you without you picking it up are nil. Not that many people keep coralsnakes in captivity and one reason is that they are difficult to feed. They eat lizards and snakes, so people usually feed them those, but it is hard to find a steady supply (you can't just buy them at the store like mice or crickets). Excellent post! One thing though- the link at the bottom to Guidelines for snakebite prevention and first aid says to tourniquet the bite. DO NOT do that! This is no longer a good medical recommendation. Andrew you might want to edit that in. Many thanks for catching that, Emily. Either that guideline changed since I linked to the site, or I overlooked the bad advice. I've changed the link so that it now points to a site that does not recommend a tourniquet. Bob, I'm very sorry you had such a bad experience, and I'm glad that you survived despite the obvious incompetence of the ER personnel you dealt with. It's true that many medical personnel are not properly trained when it comes to venomous snakebite. I didn't mean to downplay the seriousness of a snakebite in this article, but everything I wrote above is true. America, what are your chances of survival? Not good. How many of the folks reading this blog actually live in areas where these animals are to be found? I'll bet not many. Oh so often we hear or read stories of how the rattlesnake is the "snake that warns you." Rubbish. Only when the snake has determined it likely has been seen will it rattle. So, stepping on one and being envenomated is a real probability. Then there is the off-chance the fangs will find an artery or vein as with my neighbor in NW South Dakota. Her heart stopped within 3 minutes. Always, always wear tall boots or gaiters when in snake country. Thank you for your comment Richard, and I agree that being cautious and wearing tall boots or gaiters when in snake country is a good idea. However, the data show that, even without antivenom, many snakebite victims in the USA have a good chance of survival (although the prevalence of serious, long-lasting symptoms would increase dramatically). Antivenom is not given for many Copperhead bites in the southeastern USA because many cases are not serious enough to warrant it, although of course other stabilizing care is given. You've prompted me to do some more research on how snakebite survival changed in the USA as antivenom became more common and widespread; if I learn anything useful I'll post it here. It's hard for me to estimate how many people who read this blog live around venomous snakes, but I can tell you that the top 5 US states from which readers come are Texas, California, Florida, North Carolina, and Georgia, all states with plenty of venomous snakes and snakebites. And, worldwide, India (#3), Australia (#4), South Africa (#7), and Kenya (#9) are in the top 10 countries by readership. What happened with your neighbor? Did she survive the bite? Did she receive antivenom?